Metal guitarist Jeff Hanneman, founding member of rock band Slayer, has died at the age of 49. A statement on the band's Facebook page said Hanneman died of liver failure in California on May 2, 2013. The BBC reported that since 2011, Hanneman had been suffering from necrotising fasciitis, a flesh-eating disease that he is believed to have contracted from a spider bite. On their website, Slayer paid tribute to "Our Brother Jeff Hanneman, May He Rest In Peace (1964 - 2013)." The guitarist is survived by his wife Kathy, his sister and two brothers. When Slayer performed in Chicago on June 20, 2006, they had no problems with their set list. But when they performed in $ingapore on October 13, 2006, according to press reports, "Tom Araya did, at one point, mention that the band was not allowed to play certain songs." They were censored. So here is the unfettered and complete set from the Aragon Ballroom in Chicago. Hot on the Unholy Alliance Tour (acts include Thine Eyes Bleed, Children Of Bodom, Mastodon and Lamb Of God), Slayer need no introduction nor do they have any problems working the crowd. 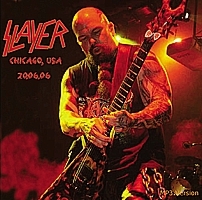 Slayer had originally been slotted to play the Aragon Ballroom on June 13 but had to postpone it to allow bassist-vocalist Tom Araya to recover from a gall bladder operation. Listening to the band rock, no one would be the wiser. For a band with a new album to be released in about two months (Christ Illusion was released in August), Slayer were confident of themselves and that fans would pick up the album. Of the 14 tracks here, only Cult is from the new album. The set actually reads like a Slayer best of - South Of Heaven, Blood Red (from Seasons In The Abyss); Disciple (from God Hates Us All); Chemical Warfare (from Haunting The Chapel); Angel Of Death (from Reign In Blood) and Antichrist (from Show No Mercy). Overall, it's as if Slayer were on the vengeance trail - there is no slacking, the songs delivered with a venom and there is ferocity in the performance that will put many metal bands to shame. This audience recording is rather crisp and a head-bangin' good time to be had by all. Thanks to darktrain for contributing the tracks. 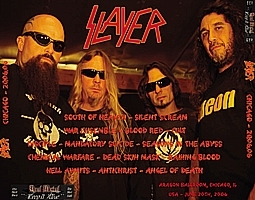 Click on the link to buy Slayer albums such as Christ Illusion, Hell Awaits, Show No Mercy and Reign In Blood.